I've been meaning to share this little reno project for a few weeks now. This was my first time trying to paint wooden furniture and I couldn't be happier with how it turned out. The goal was to give Sebastian a statement piece for his bedroom, something a little more special than I would be able to buy at the mainstream shops. After lots of Pinterest and Googling, I was inspired by these painted bookshelves I found over at Sutton Grace. I just love the clean white edges and how they look against the brightly coloured background. With this in mind, I set out to find a bookshelf for Sebastian that would be perfect for the job. 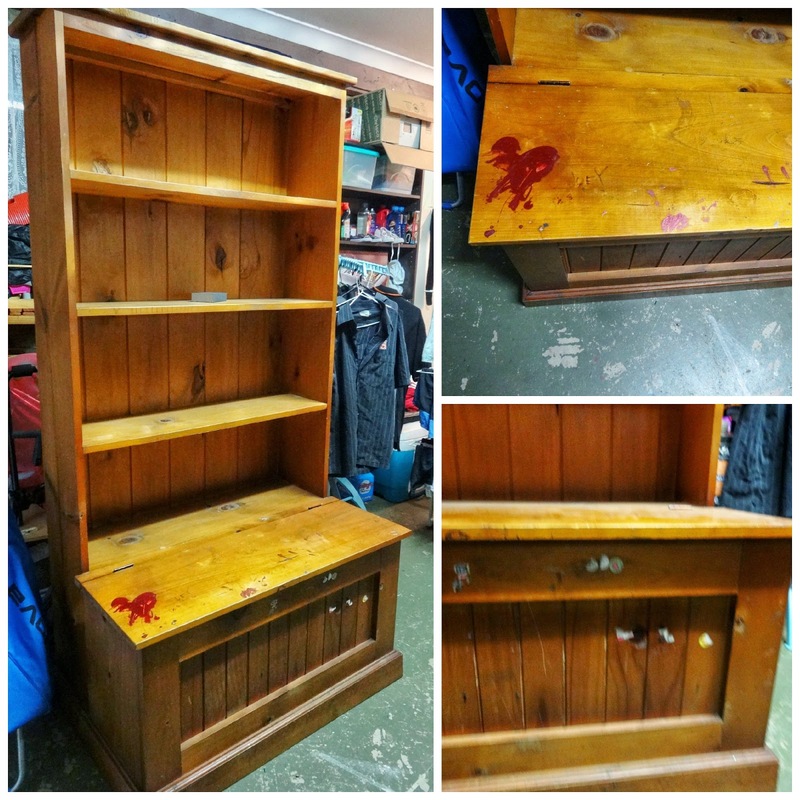 After hunting down local garage sales and eBay, I finally found this ratty specimen on Gumtree from a local seller who wouldn't mind delivering for a small fee. It has blobs of nail polish, gouges in the wood where someone has used a pen to carve out lines, and lots of stickers. Some writing in texta as well. 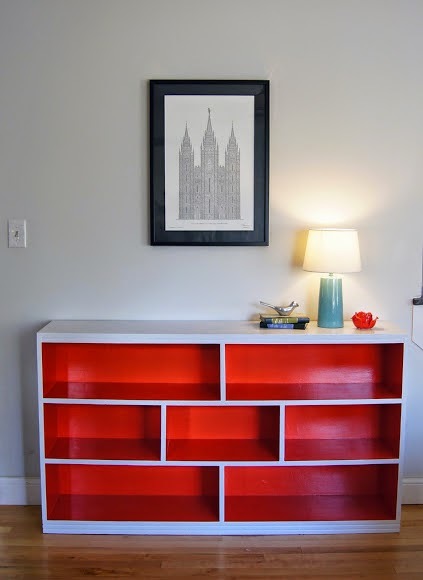 At first glance, it's definitely not a bookshelf we would want to buy for our kids, even though we love the toy box and shelf combination. We purchased it anyway for $80 (including the $10 delivery fee). $80 is a massive discount on the $300+ price tag that we found it for new in the various furniture shops nearby. 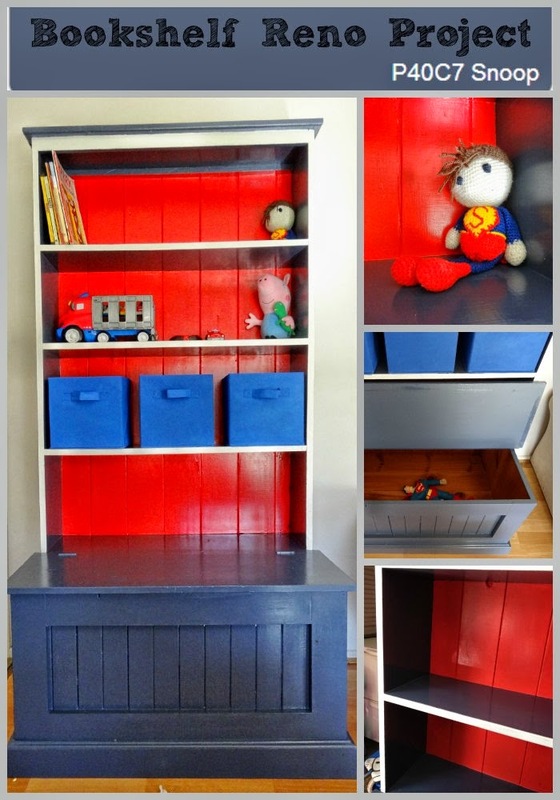 The cheapest we found was $299 at Fantastic Furniture for a simple unpainted Bookshelf with toy box. Our next visit was Bunnings for paint. We ended up choosing Dulux Low Sheen paints in Snoop, True Red, and Natural White. We were able to get the Natural White in a sample pot size, but the minimum quantity for Snoop and True Red was 1 Litre which ended up being more than enough. We have more than half the tin left for all three colours. All up our costs at Bunnings for the 3 cans of paint, brushes (cheapies), primer and sand paper came to $113.72. The materials cost more than the shelf! But it was worth it, because there is enough leftover paint and primer for other projects and I have plenty of idea's. When I bought the bookshelf I didn't realise that none of the shelves were removable, although to be fair it probably wouldn't have occurred to me that it was a problem. As it turns out, it made painting the back of the bookshelf insanely challenging, especially as we chose to only paint the back red, and not the shelves themselves. Having zero skill at painting edges without bleeding over to the adjoining edge I ended up using teeny tiny little arts and crafts paint brushes to paint all along the edges. That's as tedious as it sounds but at least I ended up with reasonably nice straight lines. I finished the project with a layer of Polycrylic Protective Finish, just to give it that shine, but also to protect it from Sebastian's sticky little Weetbix fingers. I love how its come out, it looks terrific in his bedroom and I have big plans of giving him a coordinating bed in a year or two when he grows out of his cot. 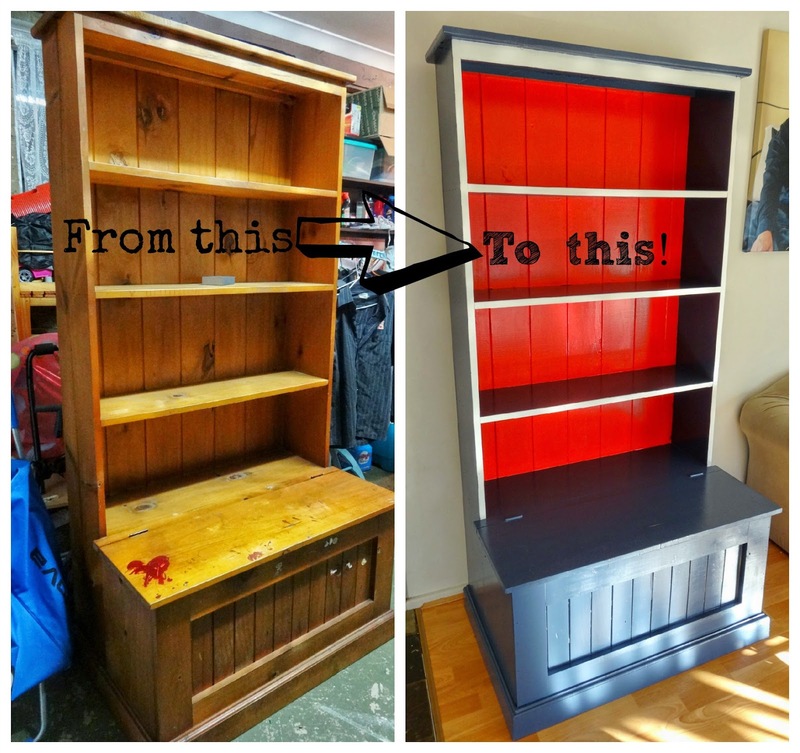 Have you completed any fun furniture renovations recently? I had so much fun with this bookshelf that I can't wait to get started on something else! Gorgeous! I often think about doing up furniture but always get bogged down in the details. Very inspiring. Love it! When I did a dresser, I had to bust out a tiny paint brush because of some detailing in the wood. Annoying. But worth it, especially in your case!